Perfectly proportioned. Light weight and comfortable. Carefully blocked and finished. At a glance: - Classic center dent fedora hat design - Dress weight rabbit fur felt hat body (120 gr) - 4 3/4" hand blocked c-shaped crown * - 2 5/8" raw edged snap brim - 1" rayon grosgrain ribbon hat band * - Rayon satin tailored lining - Two sweatband options - Care instructions included - Delivered in a hat box ideal for storing your hat This wide brimmed fedora will be hand-crafted to your exact measure using our vintage blocks and the same techniques we employ since 1930. We'll start by sizing and shaping your hat. When cool and dry we are going to cure it, brush it and trim it to make sure it has the right texture and a soft touch. Then we'll attach a high quality satin lining and hand stitch the sweatband of your choice into the hat. 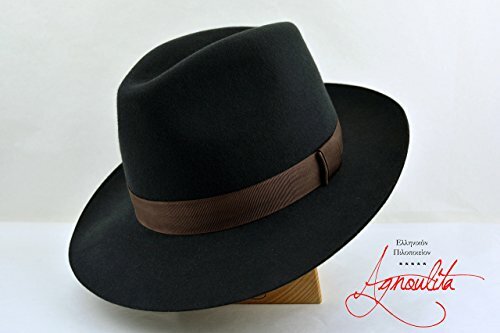 This shape is distinguished by a 2 5/8" raw edged wide brim with and an approximately 4 3/4" medium crown which is pinched in the front and indented into a center dent crease on top. We normally decorate it with a rare Greek vintage ribbon hat band but you are welcome to select any color from our ribbon swatch. Please ask us for more information about this item and your customization options. Indian Spring (one-of-a-kind) Set, original design. Tam O D'Arcy (one-of-a-kind) Set foursquare original design!